The number of Doctor Who novels out there in print is pretty staggering to think about. And a lot of times, a series with that many books is a little intimidating to get into. A lot of the long-running book franchises derived from TV shows like Star Trek and Star Wars are a little tricky for newer readers to get into since there's always the relative fear of not being able to catch up. Case in point, I've only purchased a few of the older Doctor Who stories (and mostly on sale) but beyond that I haven't made a serious commitment to buying the books more. Things sort of shifted with the recent Monster Collection of Doctor Who novels, which are essentially re-releases of older stories with nice new covers. And Illegal Alien is an adventure with the Seventh Doctor and Ace as they once again encounter the Cybermen. The foreword of this edition of the book includes the story of how this novel came to be. It seems that it was originally meant as a script for the TV show, but one thing led to another and the episode was never produced despite initially getting the green light to some extent. But the story managed to find new life as a book, and so here we are. 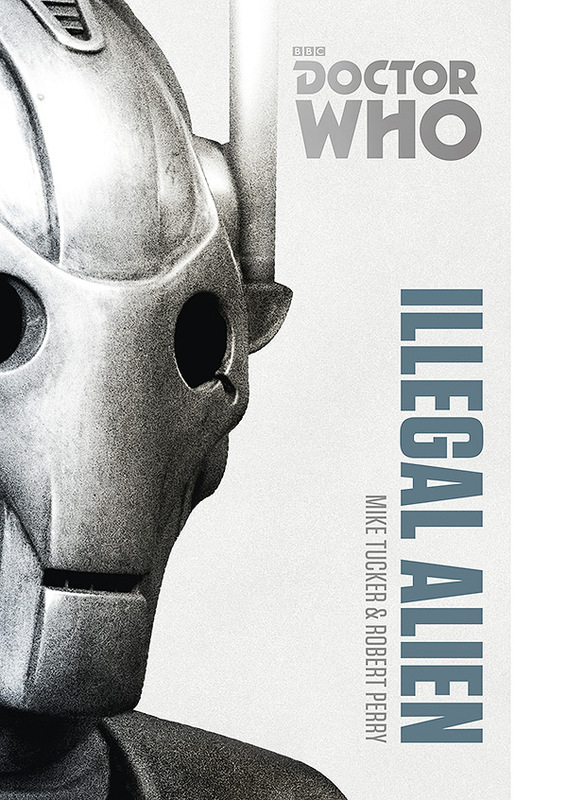 Synopsis: Illegal Alien is a Doctor Who novel written by Mike Tucker and Robert Perry. It was originally released in 1997 and was re-released recently as part of the Monster Collection of books. Right in the middle of World War II with the German Luftwaffe bombing London, there also appears to be a serial killer known as the Limehouse Lurker at work in London. And considering everything else going on in the city, the fact that the story of a local serial killer has still managed to capture the attention of Londoners is pretty significant. And then a metal sphere falls out of the sky revealing...nothing inside. Or at least by the time American detective Cody McBride arrives on the scene, there doesn't appear to be anything of importance within the sphere itself. The Doctor and Ace eventually arrive in what was initially a chance for Ace to see a German tank and experience the stress of the Blitz to yet another adventure for our resident Time Lord and his plucky companion. And given the arrival of the sphere and other odd events, the Doctor is convinced that there's an alien presence at work in war-torn London. It's just a question if they can figure out exactly what's going on before it leads to greater complications before it's too late. And we can't forget the fact that there's a war going on and the Nazis are sure to catch up with the mysterious events in London and also realize that there are certainly military applications to the technology present in the sphere. The book really did have the feel of a classic television episode in the beginning. It has a bit of a slow build-up and our initial point of perspective is following around our private detective friend Cody McBride. And he's a decent enough character for the most part - certainly good Companion material from a Doctor Who perspective and he does well in terms of setting up the scene for there rest of the adventure. To be honest, this was my first longer-term exposure to Ace as a character given my yet-to-be-completed project of watching as many of the classic Doctor Who serials as possible. And despite only having had glimpses from isolated episodes, comic book stories and miscellaneous documentaries, I'd like to think I had a good enough understanding of who Ace was. Of course I was totally wrong and kind of only knew her as a stereotype of a teenager with rather violent tendencies. This novel did a lot to expand my view of her character and her complex relationship with the Doctor. And I totally enjoyed how they depicted the Doctor in this book and how they managed to capture his unique way of dealing with challenges. As much as the Doctor is more or less the same character across his incarnations, each brings something different to the table. And this certainly helped illustrate just how this Doctor manages to puzzle through different situations and find a way to still win out in the end. And the way the whole mystery just unfolded over time was quite an enjoyable experience. It had the workings of a classic mystery novel and yet also the otherworldly feeling of every other Doctor Who episode. And despite so many characters and different plots and schemes at work, things came together at the end rather nicely and in a way that certainly helped things remain logical in the end. There were some pretty good reveals that had me appreciating the effort put into things. Doctor Who: Illegal Alien is great Doctor Who adventure with a solid story and some pretty complex, engaging characters. It manages to highlight some of the best of both the Seventh Doctor and Ace without making the incidental Companions seem hollow in comparison. Thus the book gets a nearly perfect score of 4.5 creepy metal creatures moving through the gloom out of a possible 5.